The USA, which remains the biggest overseas market for Destination Germany, continued to grow strongly, with its travelers making nearly 246,000 more overnight stays in Germany than the previous year, as part of a total volume of 5.2 million in 2014. According to the German Federal Statistical Office, the number of overnight stays by visitors from abroad in accommodation establishments with ten or more beds went up by 3.7 million in the period from January to December, a year-on-year increase of 5.1 per cent. Petra Hedorfer, Chief Executive Officer of the German National Tourist Board (GNTB): “Once again we are able to look back on an outstanding set of results – our record in 2014 provides further evidence that Germany has arrived in the top tier of international travel destinations. Arrivals went up by 4.6 per cent. This means we are comfortably above the comparable growth rate for Europe, which the UNWTO puts at 3.9 per cent, and on a par with the global growth rate of 4.7 per cent. The latest UNWTO forecasts suggest that the international travel market will expand by between 3 and 4 per cent in 2015. We will build on last year’s strong performance and take a bigger than average cut of this growth. Pillnitz Castle, the summer palace of the kings of Saxony. For something different, jump on one of the eight historic paddle steamers owned by the Saxon Steamship Co. It gives you a chance to explore the picturesque Elbe River, which divides Dresden. Beautiful mansions line the scenic riverbanks, the summer homes of Dresden’s rich and powerful families. Our tour stopped at Pillnitz Castle, the summer palace of the kings of Saxony. The complex actually has three palaces interlinked. The palaces encircle a wonderful baroque flower garden, while a lovely public park surrounds the grounds. The castle was originally bought for the mistress of John George IV. When he died, his brother, Augustus the Strong, gave it to one of his own mistresses. Since it was a warm fall day, we also strolled through the English gardens, Chinese pavilion, conifer garden and orangery. Dresden is literally a jewel box when you visit Grünes Gewölbe, the Green Vault. 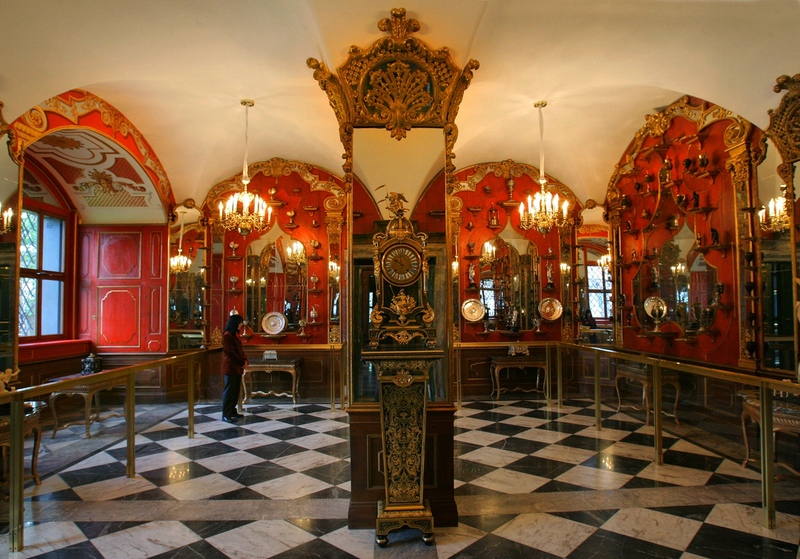 It is one of the oldest museums in the world, even older than London’s British Museum. Rulers used it as a private treasure trove in the 17th century. It was opened to the public by Augustus the Strong, who displayed his priceless works of art in gold and silver, as well as fabulous jewelry. Named after the green-painted bases of its columns, the Green Vault was rebuilt after its destruction during the war, and the treasures were returned to Dresden in 1958 after being taken by the Red Army. In 2004, the New Green Vault opened its collection of art on the second floor of the Dresden Castle. In 2006, the Historic Green Vault reopened with 3,000 magnificent pieces of jewelry made from gold, silver, amber and ivory. It also has the largest green diamond in the world. While the new vault can be visited any time, the historic vault requires advance-purchase tickets for a specific time. A limited number of tickets are also sold every morning. 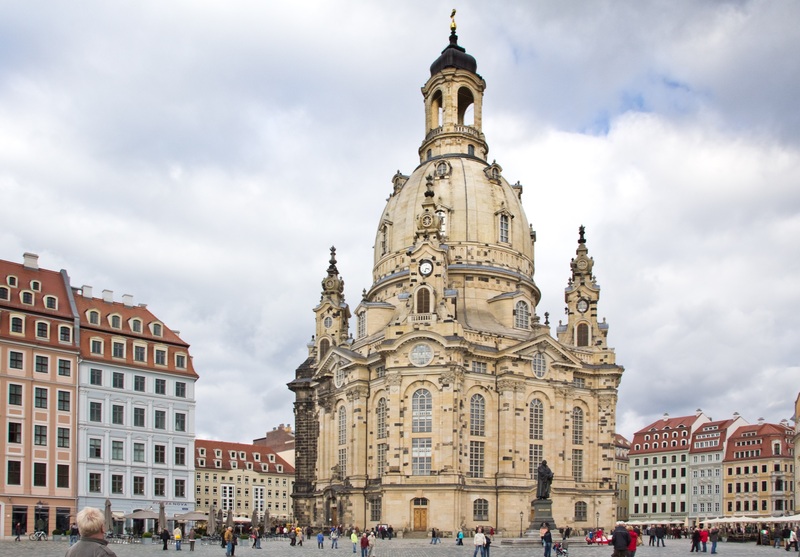 The Dresden Frauenkirche, the Church of Our Lady, is perhaps the city’s diamond. Settling in for an evening musical performance, we felt transported back in time to when Dresden was indeed one of the cultural capitals of the Old World. 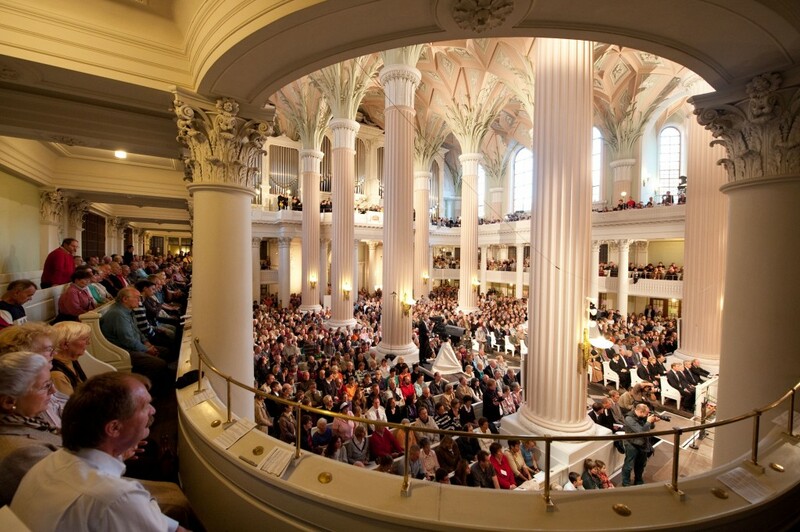 The majestic music floated up through the grand space. It’s hard to believe this stately church was destroyed in the Allied bombing. Though the church withstood two days and nights of bombing by British and American bombers in February 1945, temperatures reached 1,832 degrees from the 650,000 incendiary bombs dropped on the city.That heat is what destroyed much of the area. They say the church’s pillars glowed bright red before shattering, dropping 6,000 tons of stones through the floor. Only the altar, with its depiction of Jesus’ agony in the Garden of Gethsemane on the Mount of Olives, and the chancel were left standing. The blackened stones sat in the city center for the next 45 years. Residents balked at removing the ruins for a parking lot, and it became a war memorial. In 1982, the ruins became part of the peaceful protests against the East German government. By 1989, tens of thousands of protesters toppled the Communist regime, bringing down the Iron Curtain to reunify East and West Germany. Using the original plans, Dresden began reconstruction of the Church of Our Lady in 1993. The famous landmark was finally finished in 2005. Today, the blackened stones stand out against newer stones. Dresden has long been considered the jewel box of Saxony, Germany, with its many baroque and rococo buildings. This gem was destroyed in the controversial Allied bombing that took place during the last months of World War II. An estimated 25,000 residents died in the attack, which leveled the city center. It also lost some of its luster under the Communist regime of East Germany. But the capital city of the state of Saxony, located near the border with the Czech Republic, is shining brightly once again. Most of the historic downtown has been rebuilt, much of it from the original plans, restoring the unique culture and architecture of this city of 2 million on the Elbe River. Take your time strolling through the clean streets, and savor the jewel box built by the wealthy kings and electors of Saxony. They brought artists, architects and musicians from across Europe to Dresden and the stunning results can be seen everywhere. 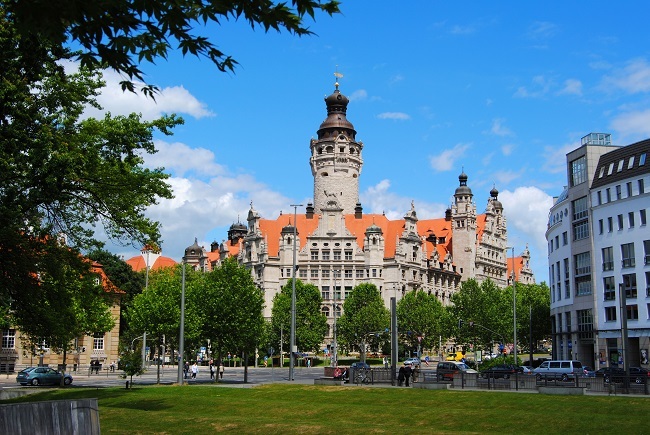 Leipzig’s imposing New City Hall has been the seat of government since 1905. It is opposite the city library on Leipzig’s ring road. The 36-story City-Hochhaus, at 466 feet tall, is the tallest building in Leipzig. Owned by Merrill Lynch, the building was designed by architect Hermann Henselmann to resemble an open book. By now everyone was hungry, so we went to Auerbach’s Cellar, probably the best-known and second-oldest restaurant in Leipzig. One of the city’s most important wine bars by the 16th century, it was described in Johann Wolfgang von Goethe’s play “Faust I” as the first place Mephistopheles takes Faust on their travels. 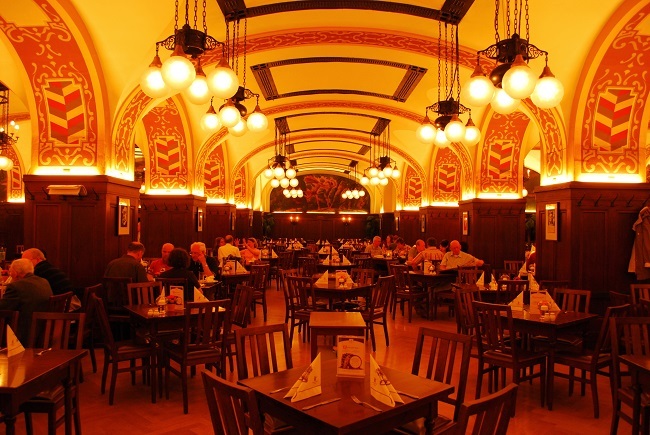 Auerbach’s Cellar sits below the Mädlerpassage shopping arcade in Leipzig’s historical district near the market. It has five historical dining rooms. According to legend, the alchemist Johann Georg Faust rode a wine barrel from the cellar to the street, something he could have accomplished only with the help of the devil. By then the tykes were tired, so we didn’t get to see some of the other famous attractions, including the botanical garden, which is the oldest in Germany; and Leipzig’s zoo c, which covers 56 acres with 850 species. The zoo is known worldwide for its carnivore exhibit. The zoo has bred more than 2,000 lions, as well as 250 rare Siberian tigers. My niece’s in-laws were anxious to show me around their lovely city. They had lived behind the Iron Curtain for many years. Today, Leipzig is very much a Saxon city. Its stately architecture reflects a rich past as a commercial center with the oldest trade fair in Germany. As we strolled down the busy boulevards, the youngsters offered a nonstop commentary loosely translated from their grandparents’ tales. We visited St. Nicholas Church, which was built around the founding of Leipzig in 1165. It is in the heart of the city at the intersection of two Roman trade routes, the Via Regia and Via Imperii. 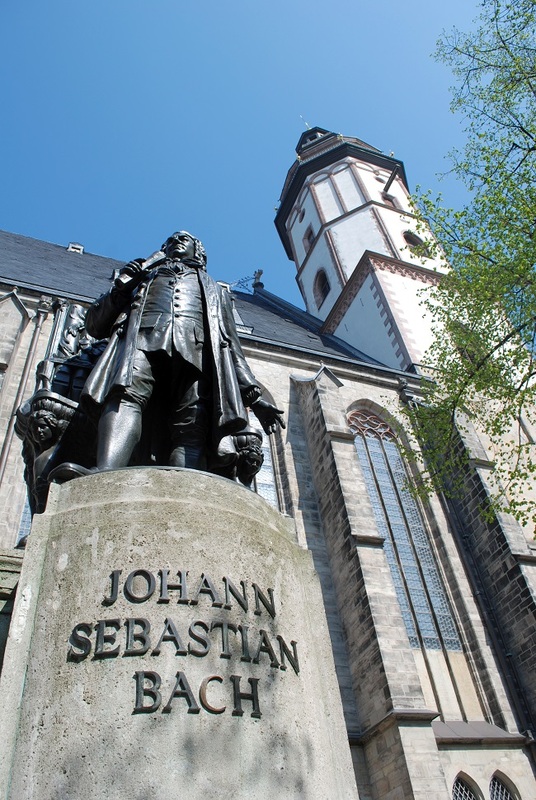 St. Thomas Lutheran Church is where Johann Sebastian Bach worked as the choir director from 1723 until his death in 1750. Bach is buried here and a statue of the famous composer sits outside the church. They drove me out to the Battle of the Nations Monument. The imposing 300-foot-tall monument commemorates Napoleon’s defeat in 1813. It is said that it stands on the spot of some of the bloodiest fighting, from where Napoleon ordered the retreat. When the Allies invaded France the next year, Napoleon was forced to abdicate and was exiled to the island of Elba in May 1814. More than 500 steps lead to a viewing platform on the top, which has wonderful views of the city. The crypt has eight large statues of fallen warriors. The second story of the monument has four great statues 31 feet tall. They represent the four legendary qualities of bravery, faith, sacrifice and fertility. Since 2009, the Festival of Lights has commemorated the nonviolent march of 70,000 demonstrators on Oct. 9, 1989. To celebrate the 25th anniversary of the peaceful revolution, the festival’s organizers are expecting tens of thousands of visitors from throughout Germany. They have planned a long weekend of cultural events, beginning with the peace prayer and democracy speech at St. Nicholas Church. 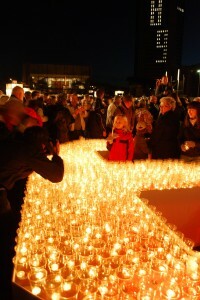 It will be followed by the Festival of Lights on Augustusplatz square that evening. 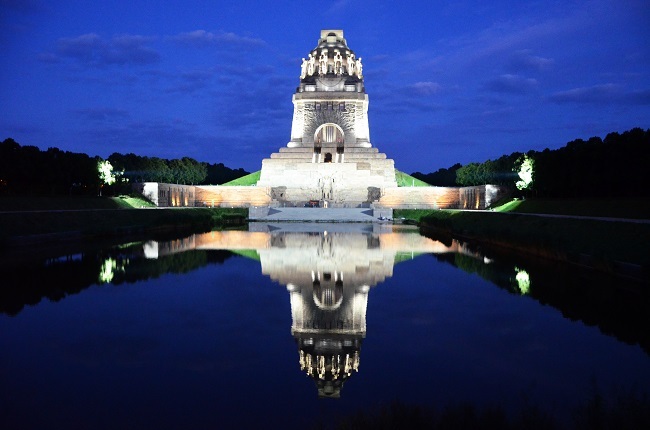 All along the route of the historical march through the city center, special exhibitions and performances will highlight the history of Germany’s division. International artists will use audio, video and lights to explore the themes of freedom, democracy, nonviolence and civic engagement. Strangely enough, the fall of the Berlin Wall 25 years ago began with a peaceful revolution in Leipzig. The nonviolent demonstrations for democracy and peace began here, then spread throughout East Germany. Stranger still, I now had family in Leipzig. My niece married a German businessman from this charming city and they volunteered to show me around, her 4- and 6-year-olds serving as my friendly translators. Our little caravan marched down the same streets where thousands of demonstrators demanded freedom. Freedom of speech, freedom to travel, freedom for political reform. This powerful movement began with morning peace prayers at St. Nicholas Church on Sundays in November 1982. Over the years, the movement grew and the demonstrations moved to Mondays. The large police force couldn’t cope with the huge nonviolent crowds. Later, 120,000 people from all over East Germany joined the demonstrations, demanding freedom at long last. Finally, Erich Honecker, the head of the Communist Party, left office after 18 years for “health reasons.” On Nov. 9, 1989, the Berlin Wall was opened. East and West Germany were finally reunited. “These events were of immense historical importance for Germany, and also played a key role in shaping the course of European unity,” notes Petra Hedorfer, chief executive of the German National Tourist Board. As part of its the worldwide photo contest on Instagram http://iconosquare.com/contests/germany25reunified, the German National Tourist Board is searching for the best pictures with the theme: “My summer holiday in Germany – 25 years after the fall of the wall” until mid-August. Travellers to Germany can tag and upload these using #germany25reunified on Facebook and Instagram. A first prize of a round-trip flight to Berlin with two nights at Hotel Lindner at Kurfürstendamm, will be present to the winner by the GNTB. Further accommodation prizes include stays at Europa-Park in Rust, at Ringhotels and the German Youth Hostel Association. The GNTB will selects the best photos according to the creativity and relevance to the topic. The current campaign and theme page http://www.germany.travel/faszination-einheit are also being promoted additionally through a separate Facebook campaign.